Standing in the hot, bare yard, the crowd of farmers sweated profusely, eyeing the collection of farm machinery, tools, harnesses and lots of other stuff. The sale bill, which eventually wound up in the museum at Hope, N.D., announced the auction at the E.P. Still farm on Aug. 29, 1936, all sales cash. As the sale droned on under the blazing sun, the ladies of the neighborhood sat quietly in the living room of the house, listening to my sister Hazel play the piano. She played softly, beautifully, and many of the ladies were wiping their eyes. When she started “Traumerei,” with its haunting melody, I cried, too. We were leaving North Dakota for Idaho, and I knew it was not likely that we would see any of these dear people again. It nearly broke my 14-year-old heart. Two days later, our big REO car left the yard for the last time, pulling a trailer filled with an awesome load of household goods, from furniture to Mom’s canned goods, and carrying our family, except for brother Richard. My parents, with Dad driving, occupied the front, and packed into the back seat were my two sisters, Mary and Hazel, my brother E.P., and me. We had a first aid kit, sewing supplies, books, lots of food, a pillow and a blanket. Yes, it was a big car. 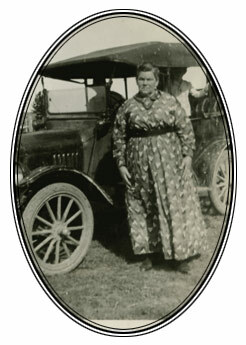 We drove west on U.S. Highway 2, a primitive road in those days, barely two lanes. My brother Richard, then 22, had worked all summer farming, not only on the home place but at a vacant farm a mile away. All crops failed that summer; there was no rain. They had also failed the previous year. Our well, with its fine, tall windmill, had in former years flowed abundantly. Now, it furnished only enough water for the house. We had to haul water from the vacant farm for the cows and horses. It was the height of the Great Depression and the onset of the dust bowl on the Central Plains, which was being rapidly deserted by farmers heading west. The decision to give up the farm to the Federal Land Bank was a heart-wrenching one. An agent from that organization visited my parents to try to talk them into hanging on for another year. However, my father was ill with asthma, and Richard planned to leave and go out on his own. They really had no choice. 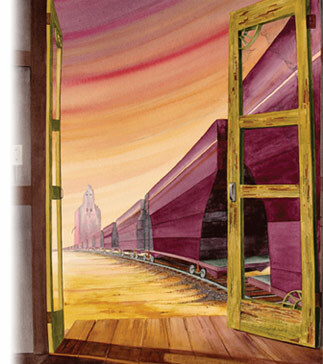 On the day we left for Sandpoint, my brother Richard was beginning his own journey to Idaho from the train depot in Blabon, N.D., ensconced in his little kingdom inside a new, 50-foot emigrant freight car on the Great Northern Railroad. Our collie dog, Queenie, and eight cows were in that car to keep him company. Stowed inside were a cream separator; bales of hay and straw; a kitchen cabinet and table; Hazel’s piano; a cot; some farm machinery, including a mower and disk; a three-burner kerosene stove and food to cook on it; four barrels of water; and a radio, the only one on the train. The coffeepot was in constant use; members of the train crew came back to join him for coffee and listen to the radio. They also shared his treats – donuts and cookies that Mom had amply provided. The crew made everything easy for him: stopping at the big water spouts to fill his water barrels and moving his car up for a smoother ride behind the engine. When they reached Devil’s Lake, N.D., the crew dumped all the water out of the barrels before the car was weighed, and after that was done, they pulled up to the overhead water spout to fill them up again. This saved a lot of money because the car was overweight. The freight car had to be inspected at Libby, Mont., and word was passed that any dogs on the train were required to have had shots before entering Idaho. The crew hid the big collie up with the engineer until they were safely across the border. Richard milked the cows twice a day and put milk through the separator. He had a full can of cream when he arrived at Sandpoint after five days of travel. He had first unloaded the cattle at Naples, where Mom’s brother Art Crabtree had a ranch. Uncle Art had met the train with his truck to haul the animals to his farm and put them out to pasture, as well as to take the household goods for storage until our family could secure a home in Sandpoint. Then Richard continued on the train to Sandpoint, where his first job was to take the full can of cream to the creamery. 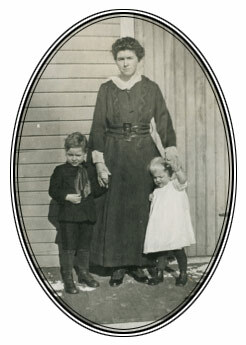 Aauthor’s family maternal grandma, Mary Crabtree, who lived much of her life in Sandpoint, in 1918. 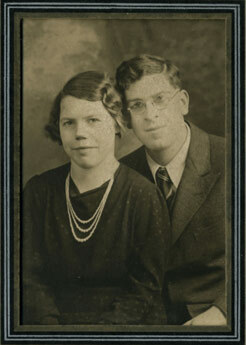 Meantime, the rest of the family had arrived in Sandpoint and were staying with Mom’s sister, Anna Altman. My parents were taken around by real estate agents who, judging them by their farmers’ clothes, took them to old, rundown farms. Mom would take one look at the house and say, “I won’t live in that!” and go back to the car. Finally the Realtors gave up on them, and Mom and Dad went out on their own. They happened to be driving along the Great Northern Loop road one day, and there, in front of a lovely place with an orchard loaded with fruit, was a “for sale” sign! “Turn in here!” Mom said. They were met outside by an old couple wearing odd clothes and wooden shoes. “You vant to see house?” asked the woman. They didn’t look at the barn or the fields. The house was a good, well-built one, but I think it was that orchard that made it so irresistible to Mom. We never had anything like that in North Dakota! So that is how we settled on that lovely place. Having come from hot, desolate, dried-up North Dakota, it was paradise. Even today, when I drive by the old home place, tears come.